Get feedback on an issue quickly from real users. There had been some debate about the large banner images and their content at the top of both the University undergraduate and postgraduate course pages. 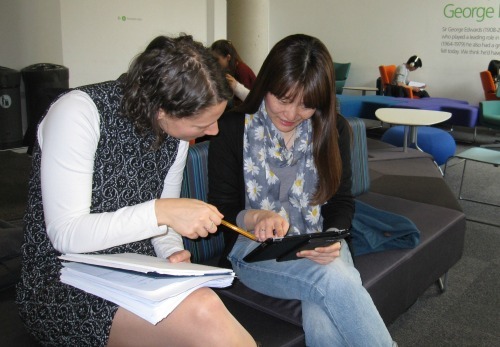 We decided the best course of action was to ask some current students what they thought, so I ventured out to the Library and did some guerrilla testing with the Team iPad. Using two different pages, one in the current style and one mocked up with more information on it, I asked 6 students the same question - what content would they be looking for if applying for a course. After spending time with the students I realised that most of them were not looking at the banners at all, but scrolling straight down to information about the course. They saw the banners as simply a pretty part of the page rather than something holding key content. Putting key messages into the banners would mean the message would be missed by many people. "If you don’t have the grades what’s the point in looking at the rest of the page?" I recommended that the banners should be left as they where for the moment, but when the team come to redesign these pages in the future more thorough testing will need to take place to make sure they make the most of the full page. Key information like required grades, fees and modules needs to be placed near the top of the page to make them easy to find, as this is what the students were looking for. This should help the University to recruit more students onto undergraduate and postgraduate courses, or at least encourage students to attend one of the open days where they can find out more.